Post House Condiminium by Alterra Opening Soon! Everyone can’t get enough of the St. Lawrence Market. There are condos sprouting up all over the place. And now, there’s going to be another one thrown in the mix! Post House Condominiums brought to you by Alterra Homes is the next addition. So why, in the age of e-mail, would a modern condominium want to name itself after such an ancient form of communication? Well, it’s situated right behind Toronto’s First Post Office. So the name is nostalgic…how sweet! Post House Condominium will be 21 stories and include 280 suites. 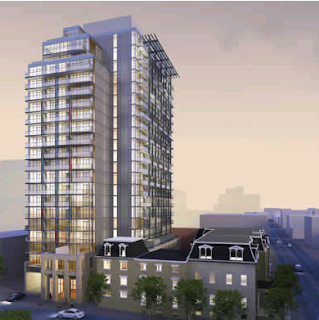 It’ll be close to the King St. subway station, St. Lawrence Market, and sooooo much more. But you’ll have to wait! It’s still in the registration phase. In the meantime, if you’re interested in learning more about Post House check ’em out here. Map the location here.